“It’s Gonna Be Another Hot Day” for the South Arkansas Arts Center and El Dorado as well. Come get out of the heat and cool off while being entertained by the SAAC’s summer musical, 110 in the Shade. In the small town of Three Point, Texas, the citizens are caught in a blistering heat wave and desperately are looking for rain and a plain-looking girl looks for romance in 110 in the Shade. 110 in the Shade comes to us from the Golden Age of Broadway musicals—the same era as shows like The Sound of Music, Camelot, Man of La Mancha, Oklahoma!, Guys and Dolls, and The Music Man. Written in 1963 based on the 1954 play The Rainmaker, 110 in the Shade features music by Harvey Schmidt and lyrics by Tom Jones, with a book by N. Richard Nash. Schmidt and Jones had recently collaborated on The Fantasticks—now the longest running musical in history—110 was their first show for the Broadway stage. While lyricist Jones took many of his lyrics directly from Nash’s original play, composer Schmidt drew on various American musical idioms to create the sound world of the show. The musicals from 1940s-1960s are known as the Golden Age of Broadway musicals. These shows with their big, full songs are well known to Broadway music lovers, as well as mainstream music aficionados. Lovers of musical theater will recognize the musical language of this show, and relate it to the shows of Rogers and Hammerstein and Lerner and Lowe, to name a few. This rarely performed show features upbeat music, great singing, intense drama, and a story that translates to all. The choreography is fairly simple, but it helps contribute to the emotions of these citizens, who are seeking more than meets the eye. Our heroine is Lizzie Curry (Hali Pinson), the plain-spoken daughter of a cattle rancher in drought-stricken East Texas whose dreams are simple dreams—to find someone who loves her for who she is. She is supported on her journey by a lush, symphonic musical score that will be brought to life by a live orchestra in SAAC’s production. Into Lizzie’s dry dusty world comes the fast-talking, smooth-moving conman Bill Starbuck (Tanner Berry) who promises to bring rain for those who have confidence in him. Starbuck lays out his pitch in a show-stopping revivalist “Rain Song” that might even have you believing in the power of a good downpour. Although Lizzie sees right through Starbuck’s wild claims, these two outsiders are nevertheless drawn to each other, even though they both start out claiming that the other is “Not Foolin’ Me” in a number that evokes the sultry rhythms of Latin dance music. Further complicating matters of the heart is the town sheriff, File (Yancey Kyle), a man hiding the pain of a failed marriage under a polite, but emotionally cold façade. He resists the clumsily obvious attempts of Lizzie’s father H.C. (Gary Hall) and brothers Noah (Darrin Riley) and Jimmy (Brandon Wallace) to arrange a meetup with Lizzie in the up-tempo dance “Poker Polka”, but later reveals that there may be a good old-fashioned love triangle brewing in the sumptuous duet “A Man and a Woman” where he and Lizzie begin to open up to each other. This musical is not just a romance or a love story – it’s more about a woman on an emotional journey to find herself in the midst of pressure from her family and friends to marry and settle down. Lizzie is battling herself, and her interactions with Starbuck help her to realize how important the simple things in life are and that she must be true to herself and her own feelings before she can love another. The lessons she learns help to give her confidence and the motivation to open her heart. 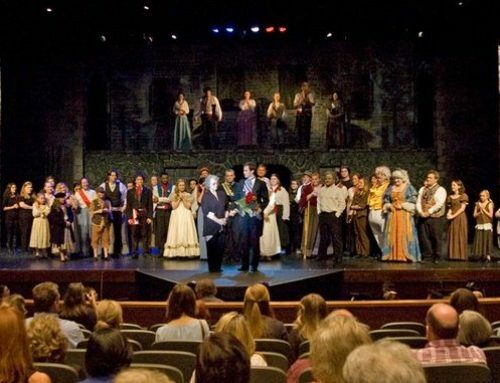 In a recent discussion with Sarah Dailey, musical director for 110 in the Shade and Shelton Harden, Performing Arts Coordinator for SAAC, they expounded on the structure of musicals and explained how things happen during a show. It gives one a glimpse into the behind the scenes workings of the play and shows the viewer some things to watch for during the action. During the conversation, Sarah delved into how the music in 110 in the Shade is “character driven”, meaning that the songs for each character go along with their personality. “Bill Starbuck himself tends to sing in more alluring popular styles like jazz, blues and even a Latin-infused number to musically emphasize his outsider status.” (Lizzie will use this same technique when she borrows the blues style in “Raunchy” to try out the persona of the town flirt.) Starbuck’s initial pitch to the townspeople in “Rain Song” begins in a slow jazz-like style and ends in a wild frenzy of hand-clapping, foot-stomping’ ‘revival-ish ‘ mood with the townspeople believing that he can actually provide what he has promised. Lizzie and her dreams of a simple life with someone to love fuel her musical style. She is a primary character, along with Starbuck, and according to Sarah, they get the big beautiful ballads with lilting lyrics and lovely music. On the other hand, the comic relief songs and big dance numbers are usually done by the second tier of characters, such as Jimmie and Snookie during “Little Red Hat”, a rousing number that gets the audience’s blood pumping. Sarah also explained another musical term called “leitmotifs”, which are little melodies associated with certain characters that are played intermittently during the show. When the audience hears the recurring leitmotif, they know there will be something concerning that character coming up soon. As an audience member, if you recognize what is happening structurally behind the scenes with the music, you will have more to watch during the show than just the actors acting out the story and enjoy it even more.